is the World Trade Center engulfed in flames. polytheism, regarded by them as the gravest sin in Islam. increasingly tolerant of public criticism. participated in a series of national discussions about reforming Saudi society. from within the Islamic fundamentalism that is Saudi Arabia’s official ideology. “The government has unlocked the door to change. Some are pushing to get in. Others are pushing to keep the door closed,” Mr. Angawi says. November, beginning to challenge princes’ and clerics’ monopoly on power. when developers extended prayer areas around Mecca’s Great Mosque. it easier for pilgrims to get around Mecca and Medina. currently battling a wave of domestic fundamentalist terrorism. understanding of the original Islam, founded in the seventh century by Muhammad. wealthy families rebuilt many shrines. holds that Islamic law bars women from driving. cultural-heritage sites in the world that are registered with the U.N.
consultant and member of the country’s Supreme Economic Council. and head-cloth. 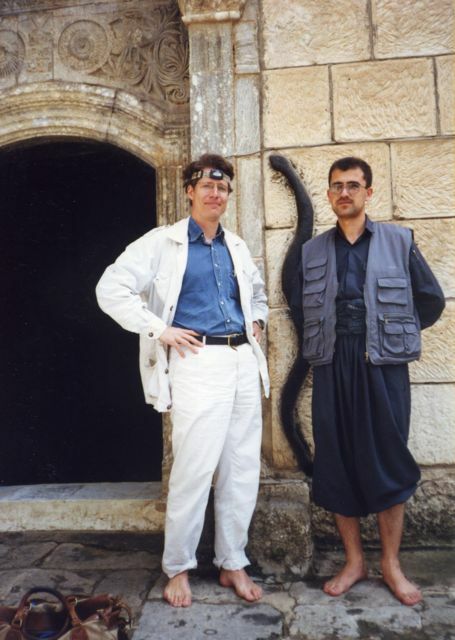 He lives in a palatial residence of his own design in Jidda. Mr.
historical diversity of Meccan architecture. 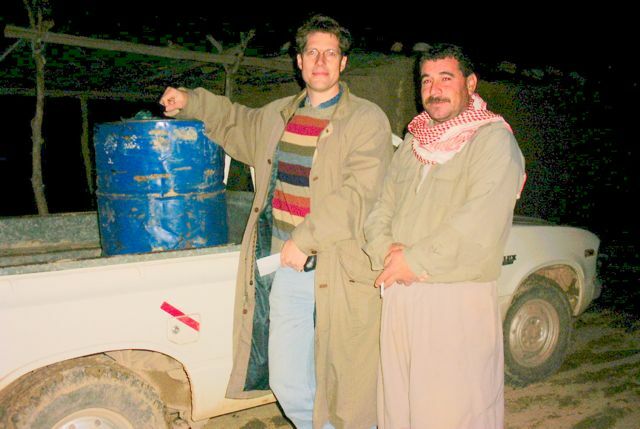 Hussein Shobokshi, scion of a Jidda merchant family and one who has seen Mr.
respect” among the nation’s small group of moderate and liberal intellectuals. licensed to organize the groups of pilgrims who come by the millions each year. modernize Mecca with as little harm as possible to its historic and holy sites. Mr. Angawi was invited to give a presentation to senior princes at court. 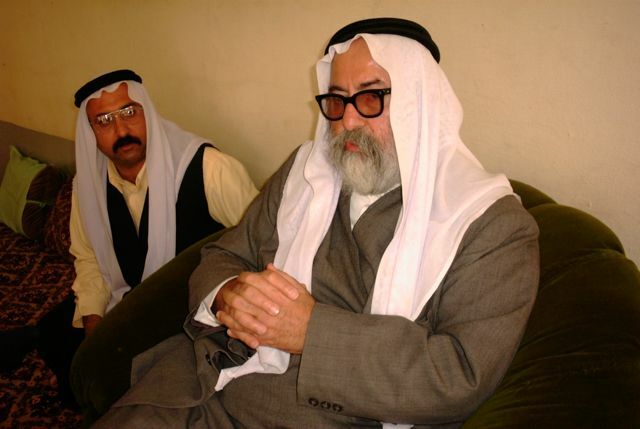 resigned his position in 1988.
relative being slaughtered in front of me,” Mr. Angawi says. now stands nearby, according to Meccans. in his book-lined study, the air heavy with incense. pilgrimage, and we want to make it safe, comfortable and spiritually rewarding. wanted to galvanize Saudi Arabia’s small, diffuse band of liberal intellectuals. such as the mercy of God, individual freedom and national heritage. and the role of minority groups such as Shiite Muslims. it in private. Twenty came, he says. Copyright (c) 2004 Dow Jones and Company, Inc. The pre-election narrative all sounds so familiar: corruption allegations, massive building projects, destruction of historic districts, new hotels, environmentalist protests, a sea of concrete suffocating the city, and evergreen hopes of one day hosting the Olympics – some elements of this article I wrote in 1989 to raise the curtain on municipal elections in Istanbul 25 years ago seem strangely familiar to the discussions ahead of Turkey’s mayorial races on March 30. The city is aflutter with election flags again and there are other, more political, similarities. 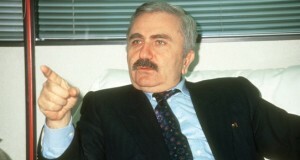 Bedrettin Dalan, standing for re-election in 1989, was part and parcel of the regime of the late Turkish leader Turgut Özal, who after six years in power was stumbling with accusations of corruption and authoritarian tendencies. The current Turkish leader, Tayyip Erdogan, 11 years in power, is fighting back against the same kind of accusations, even though the scale of everything involved seems to have multiplied many times. Kadir Topbaş, the faithful old pro-Islamic party member to whom Erdogan has entrusted the city since 2009, is lower-profile than Dalan. His ruling AKP expects to win, even if they do not share the cast-iron confidence displayed by the Motherland Party that 70 per cent of the vote was in their pocket. Back in 1989, Dalan was so sure he’d win that he filled the municipality entrance hall with tables groaning under a slap-up celebratory feast. When I passed by on election night, nobody had come to the party. The end of the story has not been happy for the ex-mayor. Since 2008, Dalan has bounced about in exile between Russia, Holland, Belarus and the U.S., running from a charge sheet of “terrorist” activities filled out against him at home. He tells newspapers that he longs to return to his home city. Istanbul, Reuters_Few people boast about what they have destroyed, but Istanbul Mayor Bedrettin Dalan says it with pride: 10,000 buildings in just five years. A new Istanbul born under Dalan symbolises the kind of energy released in Turkey since Prime Minister Turgut Ozal’s centre-right Motherland party came to power in 1983. One million new homes are under construction with state aid, dozens of arterial roads have been opened and enough pipes to supply a town of 50,000 with water are laid each month. Alongside Dalan’s efforts, non-municipal facilities have changed out of recognition: telephones, hopeless five years ago, now work well and power cuts are the exception, not the rule. The price has been high. The once-green hills beside the Bosphorus waterway are now a sea of concrete, traffic clogs city streets and the fabled skyline of minarets and mosques is frequently blotted out by sulphurous smog. “The only planning has been Dalan’s imagination,” said Celik Gulersoy, head of the semi-official Turing Club, which has lovingly restored at least 20 of the most striking relics of the former capital of the Ottoman and Byzantine Empires. Dalan says dislocation is inevitable in a city whose infrastructure was almost totally neglected as its population grew from about 1.4 million in 1960 to 7.0 million today. Under Dalan, Istanbul now has new main vegetable markets, a large bus station complex nearly ready and the sewage system, neglected since Byzantium times 500 years ago, is being totally rebuilt and designed with World Bank support. 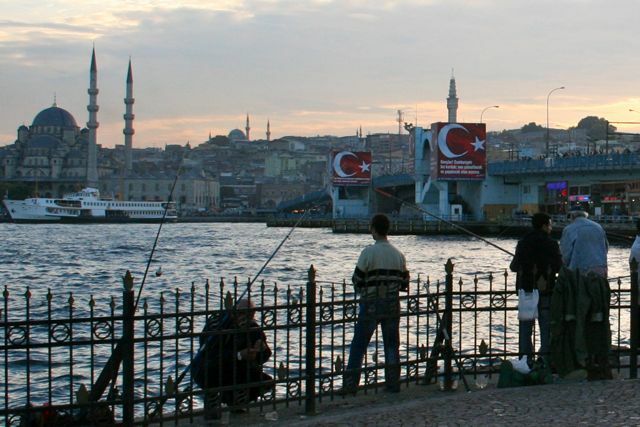 One monument to Dalan’s rule in Istanbul is his replacement of the decayed Ottoman-era Galata Bridge with an unlovely structure that has now put two great steel blocks in every picture of the Golden Horn skyline. As part of a controversial program to move colourful, traditional small tradesman out of the historic centre, a huge structure with 5,000 shops is near completion outside town. Children’s parks have taken the place of many polluting workshops along the banks of the Gold Horn sea inlet and line the Bosphorus and Marmara Sea shores as well. Much of the changes have been made possible by new laws freeing municipal finances. Dalan, whose taste for foreign projects has made him popular in foreign capitals, has already run up at least 530 million dollars of foreign debt. Ozal and Dalan are still thinking ahead and have laid down foundations for an Olympic stadium to boost Istanbul’s chances of hosting the Olympic games in the year 2000. A dream that Istanbul can recapture its former place as a gateway from Europe to the Middle East is also being pursued with a 3/4-billion dollar work trade centre and a third terminal for Istanbul Airport, already Turkey’s busiest. Part of the first metro to be built in Istanbul since 1869 is about to be opened, despite controversy about the route and expense, and fifteen first-class hotels are under construction in a city that until recently had only five. “In the summer it’s dust and in the winder it’s mud,” admitted Dalan. Municipality statistics show much remains to be done – half of Istanbul’s streets are still dirt tracks. Opinion polls say Istanbul appreciates the efforts of Dalan, a 48-year-old engineer-industrialist whose eye for publicity may stem from a past job lighting fashion-show catwalks. He is likely to win 70 per cent of the vote in next month’s local elections, the polls say, making him Turkey’s most popular politician and likely future candidate for one for the top posts in the political capital, Ankara. Under Dalan, Istanbul has reasserted its claim to lead commercial life – double the size of Ankara, it produces a quarter of Turkey’s goods, owns a third of the cars, controls two-thirds of foreign trade and is home to most banks. The yachts of the city’s new rich lie anchored near the few remaining wooden summer houses along the Bosphorus, contrasting with the lot of many forced to work on two jobs to keep pace with the galloping cost of living. 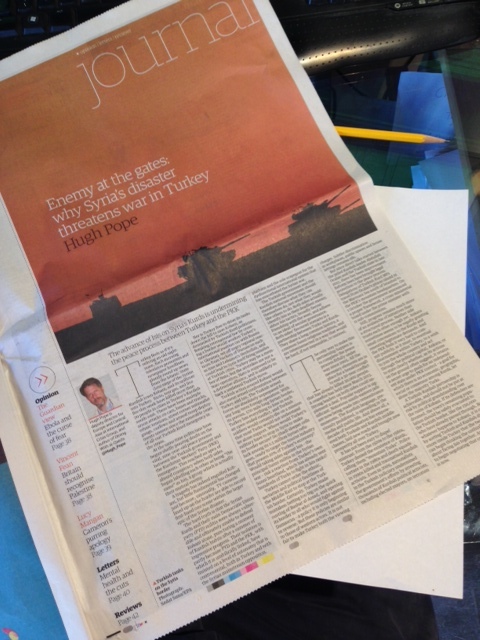 But imbalances of wealth are just one of the many striking contrasts in Istanbul, where 1940s U.S. Limousines work as taxis beside the sleek European luxury cars, and images of the 20th century co-exist with medieval buildings and lifestyles. To cement the alliance, Dalan has looked after most vote-rich Gecekondu (built-overnight) squatter settlements, building amenities and handing out 250,000 title deeds to inhabitants. The wholescale reshaping of Istanbul and accompanying speculative opportunities have brought Dalan many enemies and death threats, but he said he was not afraid to continue. While the overwhelming complain of the people centres on grim hours spent in polluted traffic jams, Dalan said his main achievement was to show that change was possible. Yigal Schleifer’s picture of urban renewal, Istanbul style – click for link to his blog on staying one step ahead of the wrecking ball. 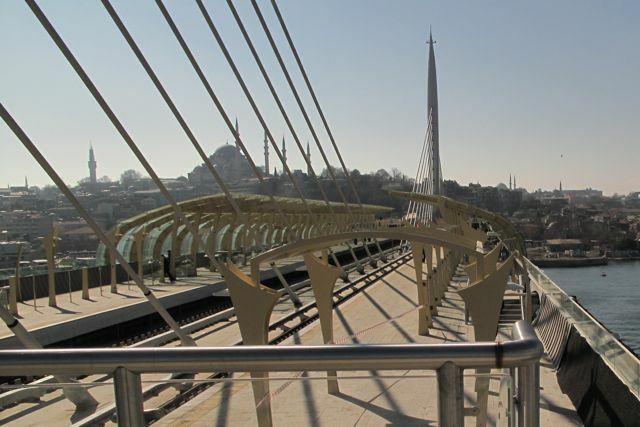 AKP got some things right – new metro lines have been a huge boon to Istanbul and the new bridge of the Golden Horn with a station in the middle has a certain élan. (AKP wasn’t responsible for choosing the route of this metro line, which arguably should have avoided the Golden Horn altogether and I think was decided in Dalan’s time too). DURRES, Albania – The line of concrete gun emplacements on the beach here once spat Albania’s defiance at the outside world. Now, one of them has become “Bunker Restaurant 1,” and the only sign of former enemy Italy, just over the Adriatic Sea, is a shiny new Italian expresso machine on the bar. In his own small way, fisherman-turned-restauranteur Arben “Jimmy” Loku, 30, has turned upside down the xenophobic logic of 500,000 to 700,000 pillboxes, underground tunnels and gun emplacements that lurk like half-buried helmets on every outcrop of mountainous Albania. His schoolteachers taught him to avoid foreign conquerors who wanted to poison him; now he brings real foreign visitors steaming plates of delicious eel, prawns and mullet. 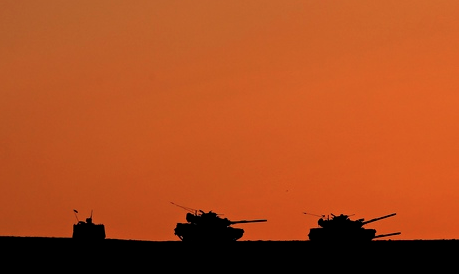 Albania, land of the bunker is starting to emerge from its Communist-era bunker mentality. 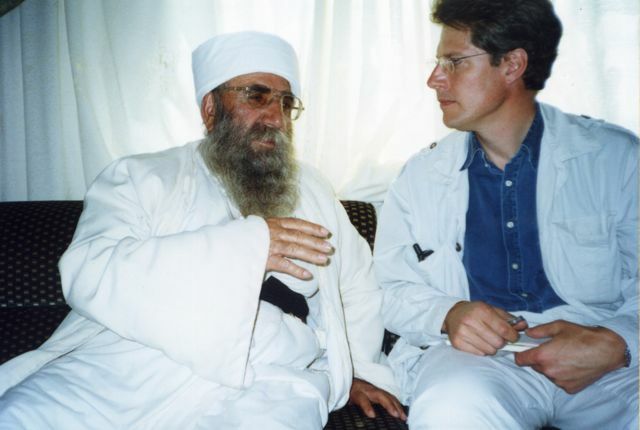 The country has thrown itself into the arms of the West, giving the North Atlantic Treaty Organization total backing in its war with Yugoslavia on behalf of the ethnic Albanians of neighborhood Kosovo. In a sign of the times, Albanians are struggling to find new uses for the bunkers built by their paranoid late dictator, Enver Hoxha – as restaurants, motels and a source of artistic inspiration. Kujtim Cashku recently directed “Kolonel Bunker,” a fictionalized account of a military officer who designed the bunkers, was crushed by the depressing experience and went on to commit suicide. For Mr. Cashku, the bunker symbolizes the wasted energy of this Balkan nation of 3.3 million people. Isolation “meant we survived but missed the opportunity for civilization,” says Mr. Cashku. And yet Albania, he adds, is crawling back from the financial scams and violence that followed the collapse of communism here in 1991. For centuries, Albania’s mountain people were so wary of foreigners that they rarely set up towns on the coast of the Adriatic, which opens up this land to the outside world. Suspicion was nurtured by five centuries of Ottoman rule, followed by a chaotic first half of the 20th century, including wars, invasions and occupation by fascist Italy and Germany. Then came Mr. Hoxha, the world War II partisan leader who, until his death in 1985, sought to seal off his Stalinist fief. The Albanian military continued to build bunkers until 1990 but has now abandoned most to weeds and decay. Raids by Serbian troops on the border with Kosovo in recent weeks have marginally revived Albania’s interest in bunker defenses. TV and radio shows encourage the populace to clean them out, and commanders are sending some part-time soldiers back in. But the country’s heart isn’t in it. “What we really need is new guns from America,” says 37-year-old Davut Veseli, a private walking back to his base after 24 hours of duty in a border bunker. 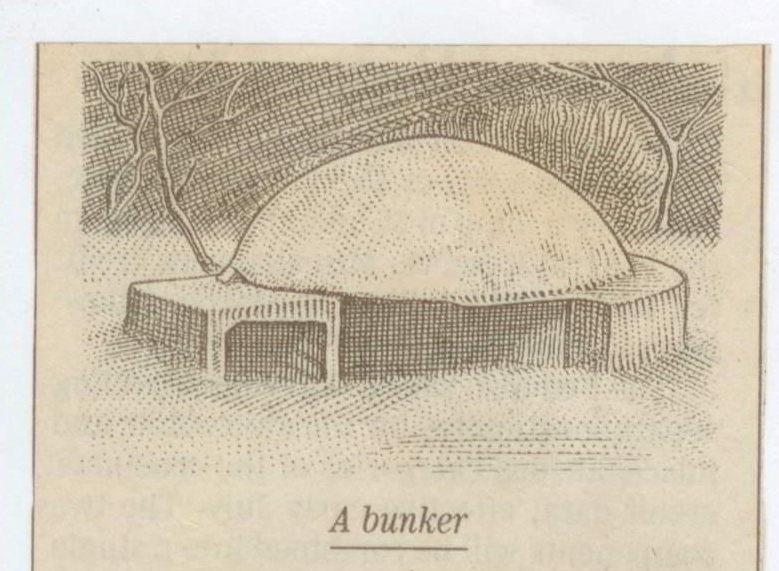 Ultimately, the bunkers are unloved, even if lovers still sometimes meet in them, a practice punished by death in Hoxha days. In the border town of Kukes, refugees from Kosovo are using the pillboxes as toilets. Elsewhere, in the absence of playgrounds, Albanian children slide down the pillboxes’ smooth domes tops. In the main valley leading into Albania from Greece, a plain cross now tops a gun-emplacement built on the site of a Greek orthodox church blown up during Mr. Hoxha’s antireligious crusade of the 1960s. Some villagers use bunkers as animal shelters or to store feed. Why don’t the Albanians just remove their bunkers? Go ahead and try. The concrete is made of hard granite, and the reinforcing rods are high-quality steel. It takes industrial-strength cranes to lear a pillbox, and the only people able to afford these seem to be members of the Albanian under-world. On a beach south of Durres, men sell cars stolen from Europe, and have moved the bunkers off to a large corner of their lot. Some Albanians pile tires inside the bunkers and set them ablaze; after a couple of days, the first layer of concrete becomes brittle enough to be chipped away, allowing access to the steel, which is worth a few dollars. The irony is that each bunker probably costs as much to build as an apartment in this impoverished country, where a bad housing shortage has been made even worse by the influx of more than 300,000 refugees from Kosovo. Possibly because of the bunkers’ association with the old regime, few Albanians use them as homes, although the 15-foot-diameter space of a gun-emplacement provides just about enough living space for a family. Then again, there are pioneers in this field, too. Jonuz and Nadire Kasmi moves into a bunker in the hills east of Durres six years ago, partly because it was near Jonuz’s brother’s house. Living in the bunker, whitewashed and decorated with plastic flowers, feels like living in Mother Bubbard’s fairytale shoe. The entrance is uncomfortably low. To swing the steel-and-concrete doors takes the weight of two people. The bunkers are cool in summer, freezing in winter; drilling through the rock-hard walls for chimneys and water pipes isn’t an option. The Kasmis’ bed is in the bricked-up gun port. Mr. Kasmi hopes that someday, a passing foreigner will give him enough money to move out of the bunker and into a real house he started building next-door with a donation from a European missionary. Meanwhile, he gets by with earnings from his car-repair workshop, made from the body of an old commercial van. Enver Hoxha may be turning in his grave at this disrespect, but his widow, Nexhmija, doesn’t seem to mind the changes afoot in Albania “I’m very emotional about Kosovo now,” says Mrs. Hoxha, peeping out at a visitor through a chicken-wire screen on the door of her apartment. “I feel so happy that all these countries came to help us,” she says in excellent French. But she still lives a kind of bunker life, rarely moving from her modest walk-up apartment in a suburb of the capital. Back at the beech in Durres, Mr. Loku’s neighbor is converting a bunker into a circular love-motel-by-the-sea. Mr. Loku dreams of building a chain of bunker motel-restaurants. In the meantime, he’s making money in more traditional Albanian ways. Sitting at one of the four small tables in his restaurant, with his sharp blue eyes twinkling from under a cap of knitted black wool, Mr. Loku likes to entertain customers with tales of smuggling speedboat-loads of illegal immigrants and refugees past Italian coast-guard cutters. “Maybe the Italians should be building the bunkers now,” he says.